Friday night, I had the most incredible experience of seeing myself in oil. Let me back up several months ago. A dear friend, Jen, approached me, saying that one of her friends was an incredible artist and Jen had told he my story. Jen’s friend, Carmen, was apparently very moved by my story and wanted to paint me for a show she had coming up, and would I be ok with that? Honestly, she could have been a terrible artist and I probably would have said yes because how cool is that? Thankfully, Carmen turned out to be one of the most gifted artists I’ve ever met and her work is truly stunning (check out her portraits at carmentmelton.com and try not to gasp at her work). Even more humbling was that she wanted to include me because of how my story had affected and inspired her (the theme of the show being “Polishing Copper,” and how we work at purifying our souls to our most essential selves). It was truly a delight to meet Carmen when she came to our house to look through pictures that she might be able to use for her painting (alas, I did not get to sit for hours on end as a model, trying desperately to maintain the same look of beatific joy and sorrow in one expression. Also, I may have read too many romance novels). Anyway, it turn out that we had quite a bit in common, including that she used to be a belly dancer, and even did a piece in the style of belly dance that I do (many belly dancers have never even heard of ATS!). We had a wonderful meeting and she left as a fast friend. Catching back up to the present, we got to see her portrait of me and Emmie on Friday at the show’s opening and it was AMAZING. We had had a little sneak peek of the piece in December when I was still sick at home, and even though it apparently wasn’t finished, it was still enough to take our breaths away. But seeing the really-and-truly finished piece was even better. She had added so many subtle details that my untrained eye couldn’t catch most of them, but they all added up to make the painting even more luminescent. One of the best surprises of the night was reading the little “artist’s statement” next to the piece (I’m sure there is an official art name for that thing, but I’m not art-literate enough to know what it’s called. You know what I’m talking about). Carmen had written essentially the most wonderful, personal little “letter” to me that no one else could have known what it meant, at least really and truly, but it had so many incredible layers to it that I could not stop smiling. Her title for the piece had a wonderful double meaning of both when Emmie came into my life (which I’m sure is what most people took from it), and when I came into Carmen’s life. The painting and the note were the most glorious “love letter” to the birth of a friendship that I have ever seen. The second incredible surprise of the evening happened later on. Peter and I had been having a wonderful conversation with our friends Jamie, Stephen and Jen (who introduced me to Carmen), and were getting ready to leave when Peter came up with a little card in his hand. 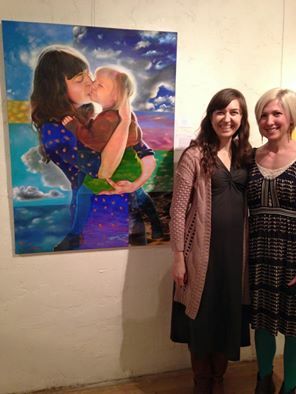 Apparently, Carmen had picked the painting of Emmie and me to be on the advertisement for the whole show! Out of more than a dozen pieces, I was so stunned that she (or someone) had picked that! Here it is, with me and the beautiful Carmen herself! OMG its wonderful!! beautiful energy! hugs!